The Smith River is without a doubt located in one of the most beautiful, lush regions of California, in part due to the fact that it has over 100 inches of rainfall annually. The coastal virgin forest that the Smith River flows through has never been logged and is the closest thing to a rainforest California can claim. During the winter, from November to March, when the Smith River typically runs, it is cold, frigid, near freezing. Your hands will feel like they might fall off, if you can even feel them at all, and if you don’t have a drysuit you will wish you had just splurged and spent the $1000. That being said, the Smith is one of the most beautiful rivers in California. The winter season is timed perfectly to offer an amazing boating option when nothing else in California is running. Rain storms build quickly on the California Coast, so prepare for wet, cold weather even if the forecast claims it will be sunny and warm. Pictures of the Smith look beautiful and exciting, but they hardly do it justice. 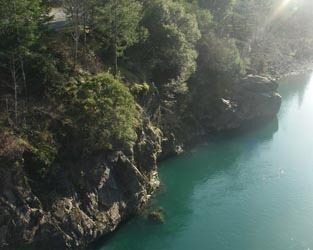 The water is a crystal clear green and the canyons are lined with California Redwoods. Even in the rain, the entire area feels somewhat surreal. The Smith River has four main run options: the North Fork, Middle Fork, South Fork, and Oregon Hole Gorge, however keep in mind that you can combine some of the stretches as well. Because there are so many different sections, you can be rafting on the Class III South Fork one day and kayaking bigger drops in Oregon Hole Gorge the next.